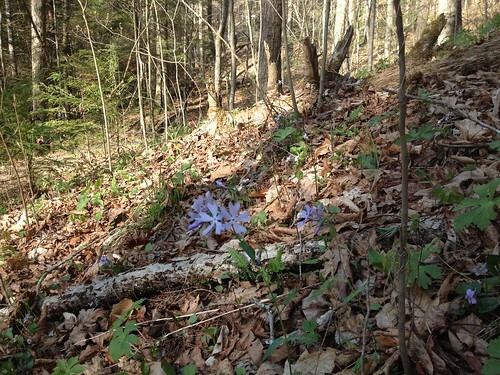 The first weekend in April had the subtle signs of spring and I was fortunate enough to get out to the Red River Gorge. 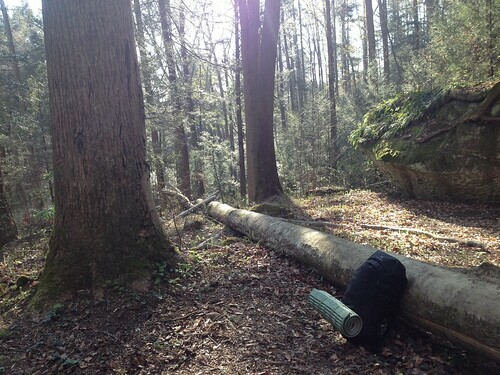 I left Stanton about 7:30 a.m. on Saturday with enough gear to comfortably spend the night and enough food for two days -- total weight about 20 pounds. 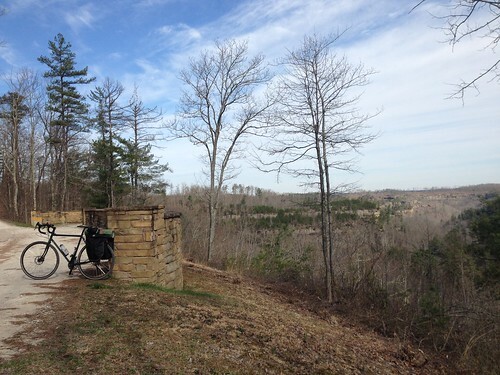 I packed the gear into the panniers on my bicycle and set out on a roundabout route to the Red River Gorge. Rather than following the north fork of the Red River as I usually do, I followed Hwy. 599 up Lower Cane Creek after getting a few miles out of town and followed that road to US 460, which I rode (for a mercifully short 3 miles) to Hwy. 713 and eventually Hatton Ridge Road (FR-165). This was about 25 miles total, and the route took me out of the Red River watershed and briefly into the Licking River watershed before returning to the Red River watershed once I arrived at Hatton Ridge. Other than checking out an overlook a few miles down Hatton Ridge Road, my plans for the day were relatively loose. 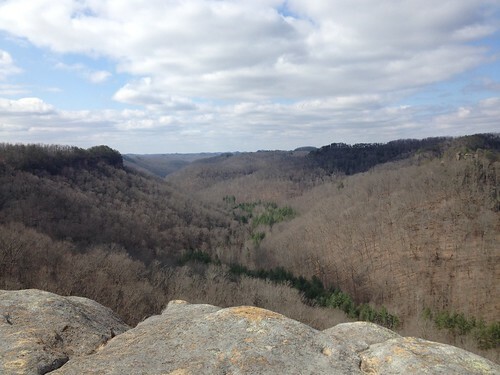 I usually plan my trips out pretty thoroughly, but the mild weather and my familiarity with the Red River Gorge led me to approach the day with an open-ended itinerary. 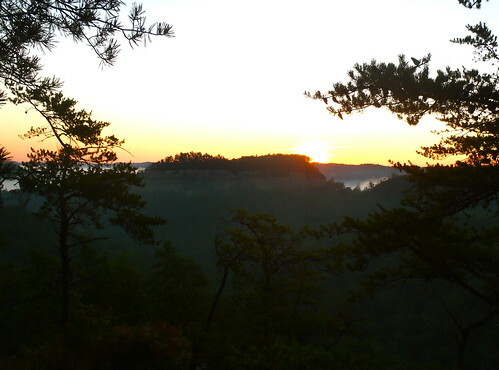 All that was certain was that I needed to be in the central area of the Red River Gorge to meet up with some friends on Sunday morning for a hike. It was a good thing I wasn’t in a hurry, because the startling amount of blowdown on Hatton Ridge Road severely slowed my pace. As anyone who follows my posts on here knows, I’m not normally one to complain about having to exert a bit of energy to achieve forward progress in scenic areas, but man . . . this was bad. 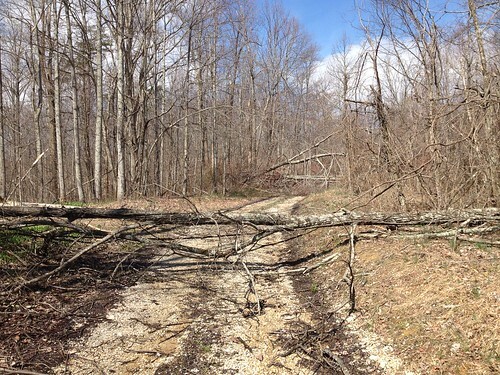 There must’ve been at least 10-15 blowdowns that completely blocked the road, requiring me to lift my bike (28 pound heavy-duty touring bike and 20 pounds of camping gear) over the fallen trees or navigate through briars, shrubs and assorted undergrowth to bypass the obstacles. Once I got on the other side of the blowdowns and reached the short trail to an overlook, I realized that I had backed myself into a bit of a corner. 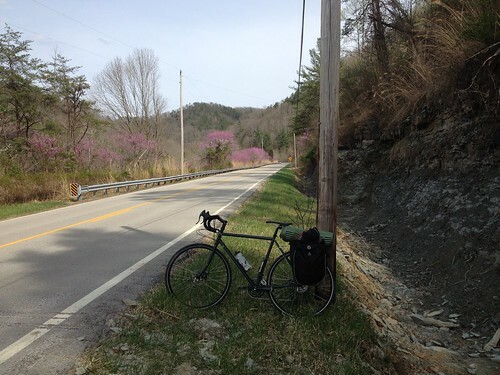 I had no desire to re-cross all the blowdowns only to have to ride 25 miles or more to reach the area of the Red River Gorge where I wanted to camp. While soaking up the incredible view and enjoying the peace of such a location, the idea came to me that I should simply walk and ride (when possible) my bike down the Powder Mill Branch. 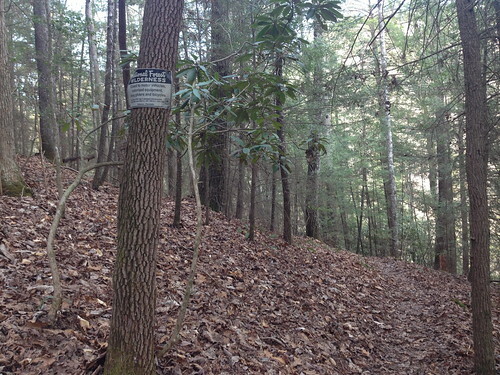 This trail is the only trail designated as being open to bicycles in the Red River Gorge and it would allow me to connect to Indian Creek and enjoy a relatively leisurely ride to the central Gorge -- specifically Tunnel Ridge Road, where I had decided I would camp. Geting ready to head down Powder Mill Branch Trail. I loaded the heavier items into my backpack and left the lighter/bulkier items in the bike panniers. This way when I had to pick my bike over blowdowns there was less to lift. What if horse use had caused severe erosion and I’d be hiking through quagmires and horse crap? (I hadn’t seen much sign of horse use on the road, but still a concern). What if I got to Indian Creek and it was too high to safely cross? (A real concern as the area had received over 2 inches of rain a day or so before -- if it was I knew I’d just camp on the bank and hop it had dropped enough to cross the next morning. No sense worrying about it . . . I’d find out soon enough and figure it out as I went along. If anything else, it would be a micro-adventure race against sunset without a registration fee or any other competitors. Turned out I was in for a pleasant surprise. All my concerns were unfounded and the trail was a great detour from biking and allowed me feel a sense of immersion in the landscape in a different way than when cruising along on a bike. 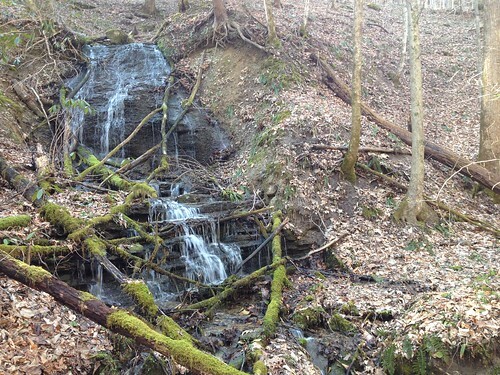 The sounds of moving water were almost constant, Powder Mill Branch and about a half-dozen other named and unnamed tributaries and tributaries of tributaries provided a great soundtrack to the 2.3 mile hike. There were even a few cascading wet-weather drops that I stopped to check out. Although I walked alongside my bike for the most part, there were several sections where I was able to ride for a hundred yards or more before having to dismount for an incline or an obstacle. 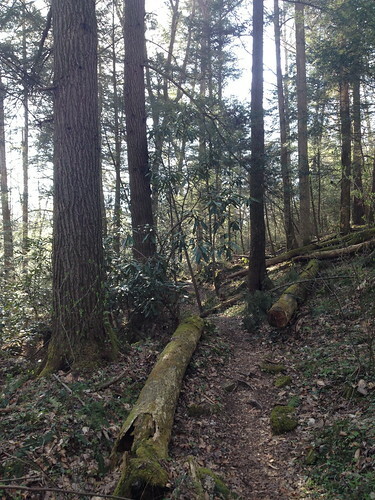 Other than a few slippery, muddy, steep sections the trail was in good shape. I encountered two hikers about halfway through the trail and found out that the crossing was easily manageable and not of any safety concern. Granted, crossing it barefoot and carrying a bike wasn't exactly something I was looking forward to, but it was good to know that it was only brief, mild discomfort and not danger that awaited me. After crossing Indian Creek . . . only 17 miles and two hills to go! I crossed Indian Creek without incident and then began pedaling toward Tunnel Ridge Road. The traffic on the road was very light for a Saturday and I enjoyed the route. Going through the Nada Tunnel on a bicycle is a neat experience and the uphill before and downhill after provided a fun challenge and subsequent reward. I stopped for water at the rest area in Slade before continuing up the hill towards Tunnel Ridge Road. This hill was a bit more of a challenge than the hill leading toward Nada Tunnel, but in the proper gearing seemed almost casual. 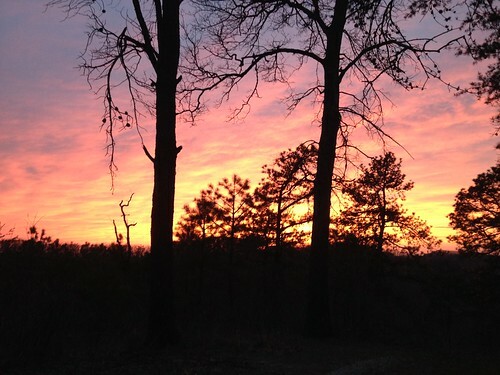 I turned onto Tunnel Ridge Road and pedaled along with the vibrant gradients of a sunset on my left, punctuated by the near-molten, red-orange orb of the sun. I reached the end of Tunnel Ridge Road/Double Arch Trail at twilight and checked out a few nearby overlooks before setting my tent up and fixing dinner (as usual, pasta with fresh spinach and mushrooms). A slight chill was in the air as I ate dinner and read a short story by Jack London. I’d hoped to stay up and do some stargazing, since the crisp and clear night would provide good visibility, but I was so tired that I went to bed around 9:30 p.m. Biking 42 miles with my backpacking gear and hiking about 5 miles over the course of the day was a recipe for a sound night’s sleep. Photo of me at one of the overlooks in 2012; photo taken by John M.
Sunrise at another overlook we visited in 2011. After the hike, we went out to eat at Sky Bridge Station in Pine Ridge (corner of Hwy. 715 and Hwy. 15 in the Red River Gorge; log cabin building), which I would recommend to anyone looking for a good quesadilla or a gourmet hot dog. Due to time constraints, I reluctantly accepted a ride home instead of biking back. 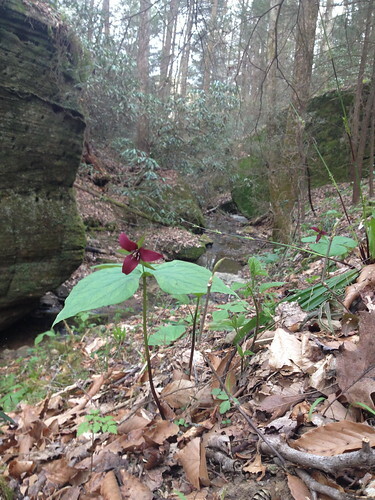 I hope to be back in the Red River Gorge biking, hiking and camping this weekend and checking out the wildflowers. Nice pics as always. 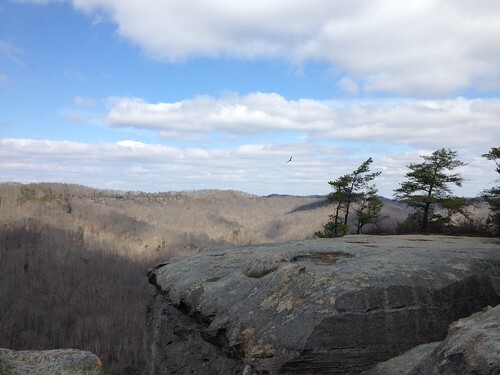 That looks like a view of Raven Rock in the last pic, which is an awesome overlook itself. 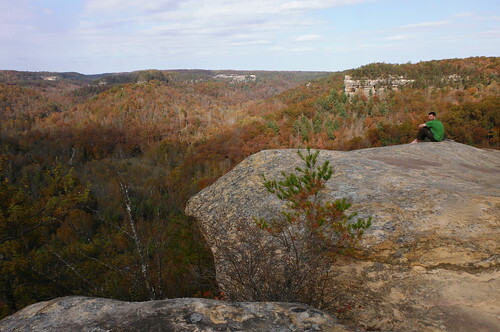 I made it back down to the Red River Gorge for a two-night trip a few weeks ago and figured I'd just update this thread rather than start a new one. Also, yeah -- that formation does kind of look like Raven Rock, but it's actually another overlook. I stuck mostly to the paved roads on the this trip and did a 6-mile round trip hike to my second night's campsite (3 miles in, 3 miles out) after locking my bike up. Beginning of a hill climb on the first day. 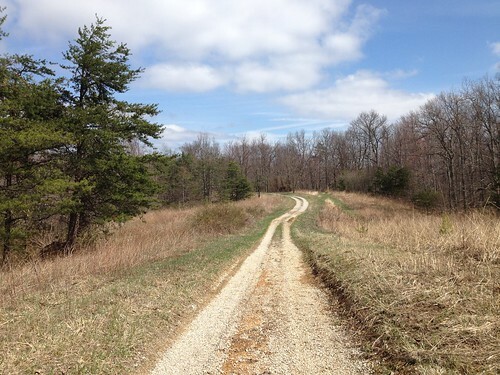 I got lucky when I turned onto the gravel forest road that took me to my first night's camp -- there were no cars on the road, so I had it all to myself for the 3 miles to a gate, then 1.5 miles on a gravel road closed to vehicles to my campsite. I took it slow the next morning, lounging around camp and reading, before pedaling down the road to a restaurant/hostel where I grabbed a bite to eat and took a shower. 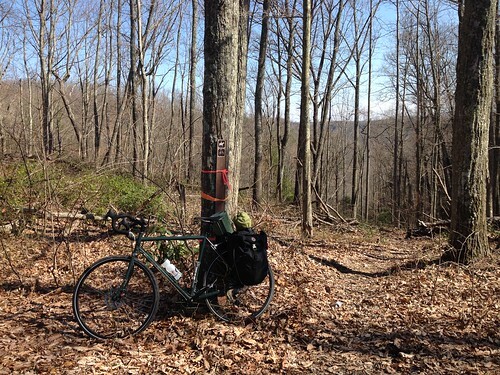 I pedaled about 10 miles to the Forest Service information center where I'd lock my bike up and then hike along a trail into the Clifty Wilderness area to one of my favorite campsites. Always a pleasure to see this sign. 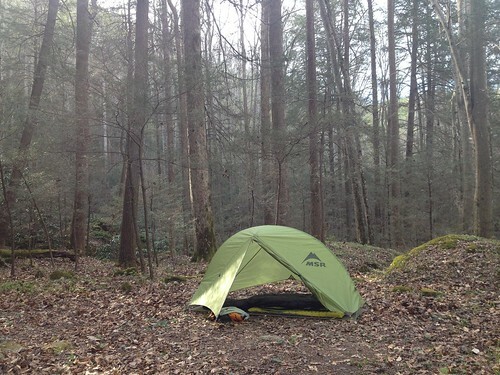 One of my favorite campsites; I've probably spent 20+ nights here. 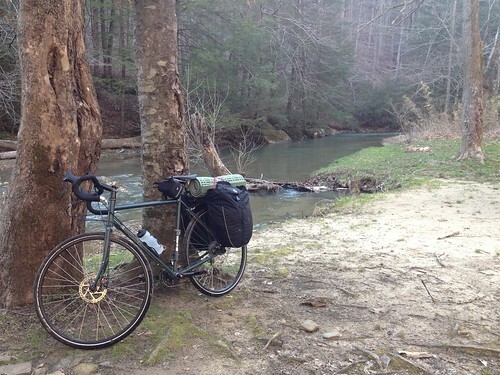 I made it down to Great Smoky Mountains National Park this past weekend (didn't bike down there . . . 220 miles one way is a bit more than I'm ready for) for one night in a campground with friends and one night solo at a backcountry site and the wildflowers down there were truly incredible -- I'll try to post some pictures from that soon. Thanks for sharing the nice pictures as usual. That really is an exquisite sunset. I may be reading into the timing too much but, in regards to your first post, I feel validated that for once it would seem like I motivated you to take a trip to an area instead of the other way around. Yeah, the sunset was pretty spectacular. Wish I had made the effort to walk out to one of the nearby overlooks to enjoy it, but I was bit tired and just made the most of enjoying it through the trees while setting up camp. And nope, you're not reading too much into it, I'd say your post ( http://www.kywilderness.com/forum/index.php?topic=6910.0) definitely made me put this area on my short-list for RRG trips this spring, and it was a great trip and wonderful scenery. So thanks, I suppose I should've acknowledged that in my post but I got so wrapped up in crafting the narrative that I didn't even think to mention it. I'd like to go back and do the loop you did and check out the arch and a few other off-trail waterfalls I heard but didn't scramble down to. There are usually yellow lady slippers blooming along Powder Mill Trail, so I might try and get down there in a week or two before those go out of bloom.